On August 10, 2017, I welcomed Governor Bill Walker and First Lady Donna Walker to Sitka for a bill signing event. I then traveled with them to Ketchikan for additional bill signings. It’s always a pleasure to have the chief executive and First Lady visit our Southeast communities. 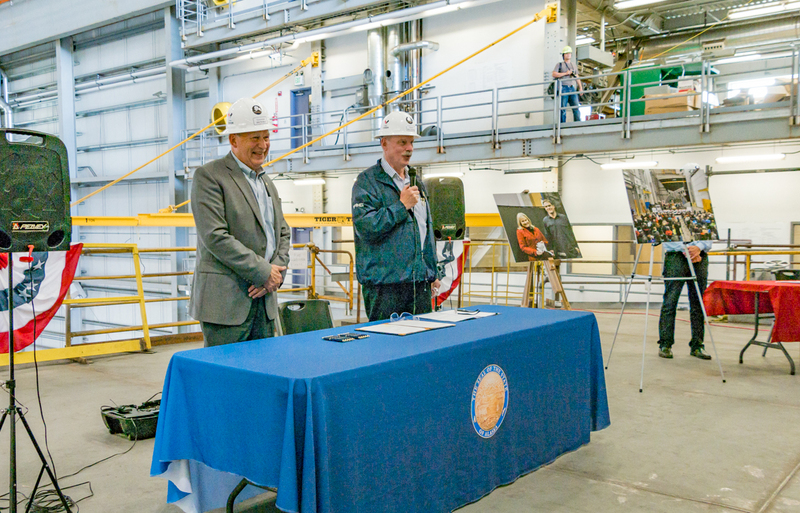 Governor Walker signed SB 3 into law at the Allen Marine shipyard in Sitka. 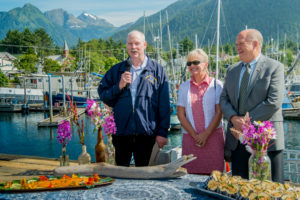 This bill continues the current oversight of wastewater treatment and use of best available technology standards on smaller cruise ships and several Alaska Marine Highway ferries. This bill preserves the ability of small cruise ships and ferries to economically operate and visit our communities. It’s important to note that wastewater requirements for the large cruise ships remain unchanged. A very special thank you to Representative Louise Stutes for carrying this bill through the House of Representatives. 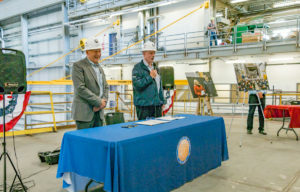 In Ketchikan the governor signed SB 33 which names the two ferries currently under construction at the state-owned shipyard. State law requires our ferries to be named after glaciers and the two new vessels will be named Tazlina and Hubbard, respectively. It was indeed a pleasure to stand on the deck of the nearly completed Tazlina built in Alaska by an Alaskan shipyard. 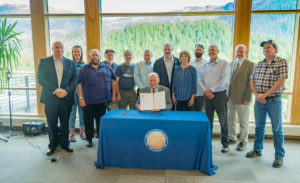 At the Ketchikan Public Library with Deer Mountain in the background, Governor Walker signed SB 88 into law. This legislation completes a land transfer between the USFS and the Alaska Mental Health Trust Authority. As I’ve stated before, this bill is a win-win-win: the timber industry will receive an opportunity to work, the Mental Health Trust will raise revenue to serve Alaskans in need, and communities will not have logging in their adjacent lands and view sheds. On August 11th, I addressed the Ketchikan Chamber of Commerce. Most of my presentation focused on the state’s budget/fiscal position and why we need to transition to a POMV payout of the Permanent Fund. Read more here. On August 14, 2017, Senate President Pete Kelly announced that I will now chair the Legislative Budget & Audit Committee (LB&A). The LB&A committee is one of two permanent interim committees of the Alaska State Legislature, the other being the Legislative Council. Senator Gary Stevens had to step down from chairing LB&A because of his candidacy for Lt. Governor. State law prohibits legislators from serving on the committee if they file to run for statewide office. I am very grateful for the opportunity to serve Alaska and I look forward to this extra duty and the challenges it will bring.